She grinned at him,causing blood to dribble down her chin. The Girl in the Steel Corset is about a girl named Finley in 19th century England who has a dark side that gives her the ability to knock out a grown man with a single punch. When she loses her job because of this very thing, she meets Griffin King, a young duke who has some abilities of his own. He sees her powers as special, and invites her to join his group of friends who all have some sort of ability. She decides to join them and help Griffin find The Machinist, a man who has been using automatons to do crime. What she finds, however, is a place where she finally belongs. This was my first steampunk book! It was recommended to me by my friend Lisa and I am so happy that I finally picked it up. Finley is such a great character–she is brave and strong and does not feel that she needs to depend on a man to protect her. In fact, she can beat most men in a fight, however she is frightened by the power her dark side gives her and seeks Griffin’s help to learn to control it. She is a bit headstrong at times but she is loyal to Griffin and his friends even though they are unsure if they can trust her at first. The best part of this book was all of the characters. I absolutely loved each and every one of them because they are so wonderfully written. The story is told from many points of view and it gives the reader an insight into many of the other characters, which I really enjoyed. They are all extremely well developed and they all work together so perfectly that it really makes the story what it is. I also loved the romance in the book and the fact that it wasn’t the sole focus of the story made it even better. 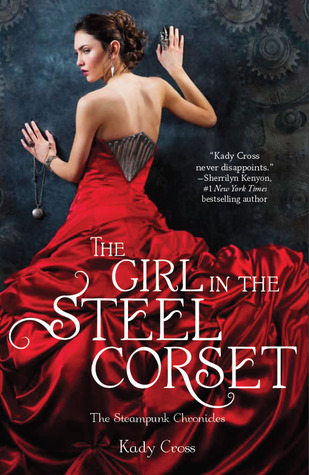 Overall, The Girl in the Steel Corset is a fantastic book full of so many different elements: history, romance, paranormal, and of course–steampunk! Kady Cross herself has described this book as X-men meets A League of Extraordinary Gentleman. I would highly recommend this one, especially if, like me, you haven’t read many steampunk books. The Girl in the Steel Corset was released May 24, 2011 and is the first book in the Steampunk Chronicles. The second book, The Girl in the Clockwork Collar was released May 22, 2012 and the third book, The Girl with the Iron Touch, is set to be released May 21, 2013.